Also: The cover is pretty cool. On Monday Zak asked me to explain why I like the old Champions supplement Aaron Allston's Strike Force so much. I haven't been able to find my copy, but I wanted to talk about it before the topic went cold and I forgot about it completely. So I'll try going over it from memory. It's been a while since I've made a totally ridiculous and utterly indefensible claim on the ol' Gameblog, so here it is: Aaron Allston was the first RPG blogger. Dude just didn't have a blog. When I first read Strike Force it was a breath of fresh air. Here was a GM with a successful campaign, talking directly to the reader, explaining how he reached that success. He presents his house rules and villains, like you would expect from any "here buy my campaign" book. 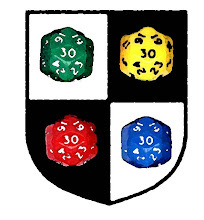 But he also provided all or most of the PCs from the campaign at both their initial 250 point versions and what they looked like with some XP spent. It was very neat to see what his players were doing with the system. But the best part of the book is his narrative of the campaign. He outlines what happened in play, but also shows what is happening behind the scenes. Allston deals with things like what to do when you have a change in player roster and what happens when campaigns get too big for their own good and you need to split the group. 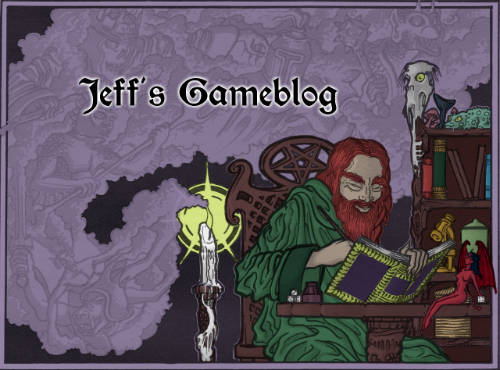 Most importantly, he covers how he had to learn the hard way that different players want different things from an rpg and that he needs to take that into consideration. 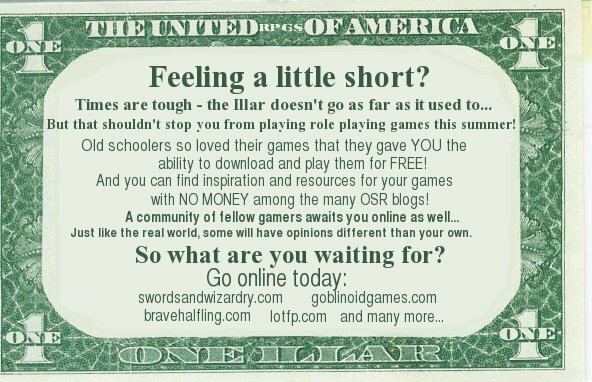 And you know the way people play RPGs in forums by writing back and forth to each other rather than talking out loud? Allston and his group invented that before they had access to the internet. They called it "bluebooking" and sometimes whole sessions of the Strike Force campaign were devoted to private conversations done via this method. In short, at the time Strike Force came out Aaron Allston was the most forward thinking mind in the hobby. I can count on one hand the number of RPG authors I consider as on-the-ball as him. Some parts of Strike Force will seem old hat to veteran GMs, some sections will be irrelevant if you don't play Champions/HERO System or another supers game, but if you can find a copy cheap don't pass it up. It was way ahead of its time and I believe a lot of the material in there wound up making its way into various core books in the Hero line after that. I agree with you and the other comments. It was awesome, and a lot of the general recommendations for the running of a superhero campaign and GMing found its way into 4th Edition Champions and Hero Systems rulebooks. --I'll have to find a replacement copy. Was StrikeForce the origin of the GM advice in the big blue Champions hard back? For years I've recommended that book and Amber to anyone running any game for GM advice. A must have. I haven't seen a copy of this in forever but since I am currently running Champions I really should try to find one. Thanks for the reminder Jeff. It certainly helped my GMing back in the day and I still use many of Allston's terms for player types. I think my copy of SF would be the very last piece of my gaming collection I would consider parting with (not that I'm parting with any of it). It's worth noting that it came out at a weird point in the lifespan of Champions: very late in the third edition period and before the Big Blue Book, a period before the internet wherein myself and most of my friends thought the game was dead (back then, unless a product was plugged in Dragon, I found out about it when I saw it on the shelves). It completely restored my love for Champions and kept me going for the next few years until I walked into the store and saw the BBB for the first time. Thanks Jeff--that does indeed sound like it's worth picking up. I got this at the time it was published (because I got everything put out for Champions back then). It was fun reading about the behind the screen stuff in a way. But I never got a good use out of it. At the time I had been playing rpgs for maybe half a decade or so. As result there wasn't anything there I didn't already know except the details of the author's campaign- and it wasn't a type of campaign I would enjoy. In the end, I wish I had held onto the money. With interest I'd have a nice bit of pocket change I think. I still read thru my battered copy for inspiration from time to time. There are so many little ideas that have crept into other games from it. Strike Force is a classic and Aaron Allston was a large influence on me as a GM. 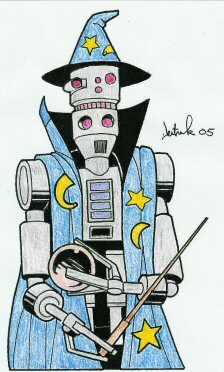 To this day, my players and I still use bluebooking, even if it is by e-mail. 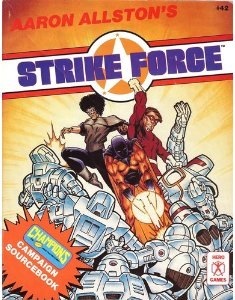 Strike Force had a huge impact on my gaming career. While on a family vacation to San Antonio, I got it at a comic shop. I read it cover to cover over the course of the trip...in the hotel room, in the car, even inside the Alamo (much to my dad's chagrin). It turned me from a player into a GM. Same here, I have a huge respect for the man (his Star Wars Wraith Squadron novels are just superb). But for the book itself, I was a bit disappointed. The characters' bio were great to read (and check the COM value of Lorelei ... ouch !) but the campaign wasn't THAT special. Get in the stew pot! I did not know such a thing existed. Hey, kids! Who wants to play some Mr. T?